"The Flash" redirects here. For the live-action series, see The Flash (1990 TV series) and The Flash (2014 TV series). For other uses of "flash", see Flash (disambiguation). Wally, his wife and twins were pulled back from the Speed Force by the Legion of Super-Heroes at the conclusion of The Lightning Saga. This set the stage for Wally West's return as the Flash after the events of The Flash: Fastest Man Alive #13 (see Bart Allen), in All Flash #1, and with The Flash (vol. 2) series, which resumed with issue #231 in August 2007. It subsequently ends with issue #247, and West, along with all the other Flash characters, play a large role in 2009's The Flash: Rebirth. He briefly appears in the Blackest Night story arc but shortly after the New 52 was launched and the character was nowhere to be seen. He is back as the Flash in DC Rebirth and joined the Titans. ^ Rogers, Vaneta (2007-07-15). "Mark Waid Returns to The Flash". Newsarama. Archived from the original on 2007-07-02. Retrieved 2007-07-15. ^ "DC Universe". Previews. 17 (5): 82. May 2007. ^ "DC Universe". Previews. 17 (6): 86. June 2007. ^ "SDCC News: Johns and Van Sciver Announce Flash Rebirth: News Bulletins". Comics Bulletin. 2008-07-24. Retrieved 2010-09-14. ^ a b "SDCC '08 – Johns & Van Sciver Talk Flash: Rebirth". Newsarama.com. Retrieved 2010-09-14. ^ "NYCC – DC Universe Panel – CBR". Comicbookresources.com. Retrieved 2010-09-14. ^ Flash (vol. 2) #97–99. ^ Kakalios, James (2005). The Physics of Superheores. New York: Gotham Books/Penguin Group, Inc. ISBN 978-1-59240-146-8. The author, James Kakalios, is a physics professor. Page 250, caption: "Fig. 33. 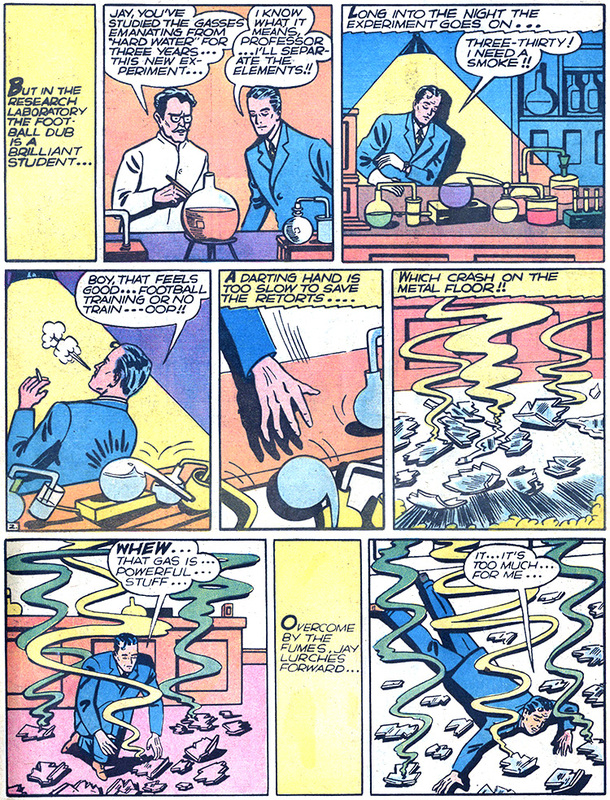 Scene from "Flash #123, where Jay Garrick, the Golden Age Flash, demonstrates the quantum mechanical process known as 'tunneling.' Page 251: There is no doubt how The Flash, both the Golden and Silver Age versions, is able to use his great speed to pass through solid objects, as shown in fig. 33. He is able to increase his kinetic energy to the point where the probability, from the Schrodinger equation, of passing through the wall becomes nearly certain." ^ "Ezra Miller Confirms The Flash For Batman vs Superman". Movie Pilot.com. Retrieved September 8, 2015. ^ "Edgar Church/Mile High Flash Comics #1 Sells for $450,000". Itsalljustcomics.com. 2010-03-16. Retrieved 2010-09-14. Crimson Lightning – An online index to the comic book adventures of the Flash. Alan Kistler's Profile On: The Flash – An analysis of the history of the Flash by comic book historian Alan Kistler.